What makes an efficient car? The current state of arctic sea ice (see graph below) sends a chill down my spine. So what it says is that the ice is melting furiously, and looks like it’s not yet slowing down even though the days have started to draw in. However, any scientist will tell you that no single data point can be used as evidence of global warming, there are simply too many fluctuations for anything to be concluded over anything but the longest timescales. We cannot simply look at the mean temperature for a hot year and say, there you go, global warming! Now, the issue is, there are well-known cycles over pretty much all timescales – this pretty much undermines all serious attempts at prediction. So, what to do? Well all is not lost; there are still some clever little leading indicators we can look at to give us that sobering wake up call. Firstly, we know CO2 concentration is up, no doubt or argument, this can be seen in the famous Hawaii data above, complete with the seasonal ‘breathing’ by global plant-life. The argument is about whether the greenhouse models that say this will result in warming will turn out right. I honestly don’t know, but I wouldn’t even have to wonder if the CO2 levels weren’t going up, would I? Secondly, rather looking at averages or ‘new records’, we can look at the frequency of records. So rather than saying, “we just had the hottest summer ever in some parts of the US, there’s the proof” we can look at how often records are set all over the world – hottest, coldest, wettest, dryest and so on. This approach creates a filter; if it shows there are more records being broken on the hot side than the cold side, could this be an indicator? I hope not, because there are. Again, it could be part of a long-term cycle that could bottom out any time now. But on the other hand, if it was going the other way, I wouldn’t have to hope, would I? Now the sea ice. 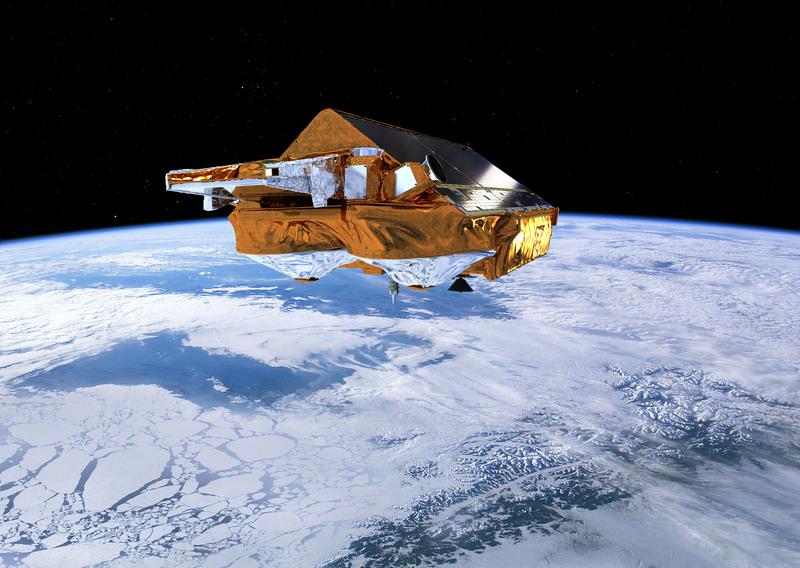 The sea ice is another proxy for temperature. The reason it’s interesting to climatologists is because it is a natural way to ‘sum-up’ the total warmth for the year and longer; if ice is reducing over several years, it means that there has been a net surplus of warmth. Today we are seeing a new record set for minimal northern sea ice. And not only is there less area of ice, but it is thinner than previously realized and some models now suggest we could be ice-free in late summer in my lifetime. Now if that does not strike you cold, then I didn’t make myself clear. This is not some political posturing, not some ‘big-business’ spin, nor greeny fear mongering. It’s a cold clean fact you can interpret for yourself, and it could not be clearer. So is it time to panic? Well it can still be argued the melting is part of a cycle, it could of course reverse and hey, no biggy. After all, what does it matter how much ice there is? Sea level is the ultimate proxy for warming. Indeed, sea level change can be so serious, maybe it is the problem rather than the symptom. If the ice on Greenland and Antarctica melt, the rise in sea level would displace hundreds of millions of people and change the landscape so dramatically it’s a fair bet wars and famine will follow. Now that is serious. Now, it looks pretty conclusive but hold the boat. Some say’s it’s proof of warming but not everyone agrees. It’s true it could again be a cycle. Also, the sea level rise is fairly gradual; what people are really arguing about is whether we should expect it to speed up. If temperature goes up a few degrees it could go up 5 or 10 times faster. The speed is the issue. Humanity can cope if the level goes up slowly enough, sure, countries like Tuvalu will be in big trouble either way, but countries like Bangladesh and cities like New York and London will only be in real trouble if the rate increases. Canaries taken into mines in order to detect poisonous gases; the idea being they would suffer the gas faster than the people and if the canary dropped, it was time to vacate. Do we have systems that are hypersensitive to climate change? Yes! There are many delicately balanced ecosystems that can can pushed over a tipping point with the lightest of touch. Is there an increase in the rate of species loss, or an increase in desertification? Yes! We can also look at how far north certain plants can survive, how high up mountains trees can live or how early the first buds of spring arrive. Again, these indicators fail to give solace. Everywhere we look we see changes, bleached coral, absent butterflies, retreating glaciers. The conservative approach is to ascribe these changes to the usual cut and thrust of life on earth; some take solace from the fact that humankind has survived because we are the supreme adapters and that the loss of species is exactly how the stronger ones are selected. Yes, we are great at adapting, however, to kill any complacency that may create, consider the following: for humans just ‘surviving’ is not the goal, that’s easy, we also need to minimize suffering and death, a much tougher aim. We’ve also just recently reduced our adaptability significantly by creating ‘countries’. Countries may seem innocuous, but they come with borders – and mean we can no longer migrate with the climate. Trade across border also needs to be of roughly the same value in both directions. While some countries will actually see productivity benefits from global warming, most will not, and without the freedom to move, famine will result. Trade imbalances mean inequality will become extreme. The poorest will suffer the most. So for now changes are happening, and advances in agricultural technology are easily coping; however, because ecosystems are often a fine balance between strong opposing forces, changes may be fast should one of the ropes snap. Looking at the long history of the earth we have seen much hotter and much colder scenes. 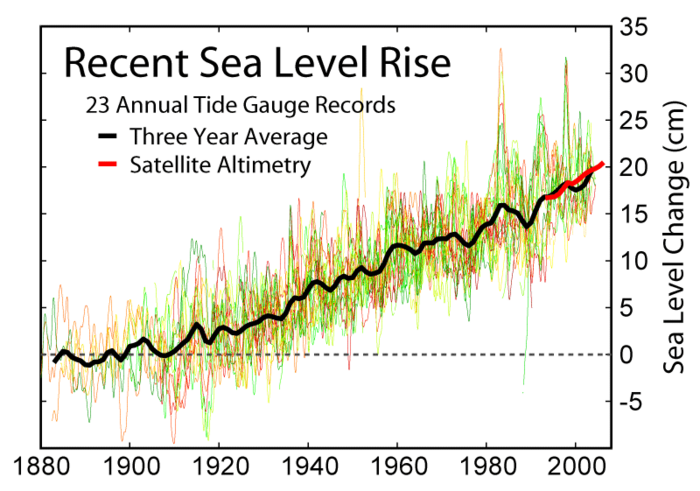 We have seen much higher and much lower sea levels. We are being wishful to assume we will stay as we have for the last 10,000 years. It may last, or it may change. Natural cycles could ruin us. And mankind is probably fraying the ropes by messing with CO2 levels. Can we predict if we are about to fall off of our stable plateau? No, probably not. But is it possible? Heck yeah. What does the earth’s history tell us about climate? And how can we find out if our house will be one that sinks should sea levels rise? Find out here! Can we change the planet’s dangerous behavior? Read my call for a study in mass behavior. Hysteresis (hiss-ter-ee-sis). Lovely word. But what on earth does it mean? Hysteresis is one of those typically jargonny words used by scientists that instantly renders the entire sentence if not lecture lost on its audience. Sure, you can look it up on wikipedia, but you may die of boredom before you get to the point, so I am going to explain it here. Let’s go for a walk. Let’s say we are ten years old and we are walking to school. The route is simple. The school is a few hundred yards down the hill on the other side of the road. Now consider the question: at what stage do we cross the road? Immediately? Or do we walk all the way to opposite the school before crossing – or somewhere between? Assuming there are no ‘official’ crossing points, I bet you cross immediately, then walk down the far side of the road. How can I make this prediction? Well, I assume that crossing the road requires there to be no traffic, so if there is no traffic as you start the journey, it is a good time to cross. If there is traffic, you just start walking down the road until a gap appears, then you cross. This strategy allows you to cross without losing any time. If your strategy had been to cross at the school there is a real risk you will need to wait, thus losing time. So it turns out the best strategy to avoid any waiting is to cross as soon as you can. So now picture your walk home. Again, it makes sense to cross early on. The result is that the best route to school is not the same as the best route from school. This is an example of hysteresis – or a ‘path dependent phenomena’. The dictionary will drone on about magnetism and capacitance and imaginary numbers. A much nicer example is melting and freezing of materials – some substances actually melt and freeze at different temperatures. This shows that the answer to the question: “is X a solid at temperature Y?” actually depends – on the path taken to that temperature. Just like what side of the road you are halfway between home and school will depend on whether you are coming or going. It seems to me that falling asleep and waking up also bear some of the hallmarks of hysteresis; although they could be considered a simple state change in opposite directions, they feel very different to me – I seem to drift to sleep, but tend to wake to alertness rather suddenly. Now think of a golf club in mid swing. As the golfer swings, the head of the club lags behind the shaft. If the golfer where to swing in reverse, the club head would lag in the other direction – thus, you can tell the direction of movement from a still photograph. We can therefore say the shape of a golf club exhibits hysteresis – and again you see see why it is so-called “path dependent”. This logic can be taken further still – wetting is not the opposite of drying and likewise heating is rarely the inverse of of cooling. Let’s imagine for example that you want to make a chicken pie warm on the inside and cool on the outside. This is best done by warming the whole pie and then letting it cool a little. The temperature ‘profile’ inside your pie thus depends not only on the recent temperature but has a complex relationship with its more distant temperature history. This particular point is somewhat salient at the moment as we ask the question: is the earth heating up? Good question. I’m not a fan of jargon, and hysteresis is not a word I hope to need to use in my smalltalk. However, you can see that it encapsulates a rather specific and increasingly important concept that is pretty hard to replace with two or three simpler words; thus it passes my test of “words a scientist should understand that most don’t”. Please let me know your own additions to such a list! Could Google Earth Show Sea Level Change Impacts? I just finished reading Storms of my Grandchildren by James Hansen – it is basically an alarming presentation of evidence that not only is climate change affected by humans, but that the changes could indeed be dramatic and soon. While the author warns of effects more extreme than the ‘consensus’ of the IPCC, he argues very credibly. It is worthwhile to note that in achieving consensus, any group needs to ‘normalise’ opinion (i.e. compromise). The IPCC cannot say “all is well”, as there is undeniable evidence that it isn’t, and they are, after all, a bunch of tree huggers (said with love!) . However, it cannot say “ban all coal” either, because it would render itself at odds with governments, and find the party invitations will dry up sharpish. The IPCC said what it had to say from day one: there is a massive risk of disaster and we need to find a pragmatic way forward that does not punish any sector too harshly. It also appreciates that it needs to gradually adjust the Zeitgeist. Each report will get more draconian, not just because the evidence is getting stronger, but because the audience is softening up with time. Of course, this public opinion inertia takes up time, which is exactly what we haven’t got. James Hansen, is therefore now acting as a representative for those who feel the urgency is lacking. He accepts that his invitations to the Whitehouse may have got lost in the post of late, but he is gathering a following and starting to get heard. Anyway, on to my point. While reading the book, I realized not only the lack of action against climate change, but also the lack of action to prepare for it. I read up on what various people are thinking (including the IPCC take), and I was wondering how much the individual can do. In a slump of morbidity (you read the book, you may have one too), I wondered how my town may look if sea levels does rise a few meters. It is not too hard to trace out the new shoreline, but it did make me think I could write a program that could plug into Google Earth in which you could dial in the sea level and take a look. Perhaps I should start saving for a nice big boat? What exactly is temperature? Ever wondered? We take it for granted. We understand it. It is obvious what temperature is. Cold, warm, hot…obvious. But how many of us have asked the next question: what is the real difference between a hot stone and a cold one? The answer is interesting and helps us to realise that measuring temperature is much trickier than we tend to suppose. Over many hundreds of years, many clever people have devised lots of experiments to understand what temperature is, I hope in this article to round up the facts! For much of history, there were only a few sources of heat – the sun, fire, lava and of course the warmth of living creatures. People were puzzled by what created it, but it was immediately obvious that it had one consistency – whenever it had the chance, it flowed – put something hot next to something cold, and the heat would flow. Of course you could argue that it was the ‘cold’ that flowed (the other way), but there were no obvious sources of ‘cold’. While ice was clearly cold, it was not a sustainable ‘source’ of cold the way a fire was. It was also noted that heat melted things – like fat or butter and that it make some liquids (like molasses) thinner. It could even boil water and make it ‘vanish’. The mechanisms for these were unknown and a source of fascination for early scientists. Early experimenters noticed that gases would increase in volume upon heating, and that compressing gases would cause them to heat up. They also investigated other sources of heat, like friction, (rubbing your hands together). Once you have a vacuum (no pressure), you should have ‘no temperature’. Thus their observations implied that there really was a limit to how cold things could get, and predicted it was around -275 Celsius. They were of course unable to cool anything that far simply by expanding it because heat always flows into cold things, so to achieve this you need much better insulation than they had available. So they had a big clue in the search to understand what temperature is, but still no explanation. It took until 1738 until another great scientist moved us forward. Daniel Bernoulli realised you could use Newton’s (relatively new) laws to derive Boyle’s temperature-pressure relationship. He basically asked: what if gas was made of a large number of very small billiard balls flying around crashing into everything? What if pressure was just the result of all these collisions? Using this theory he realised, for the first time I think, what temperature truly is. It turns out that his model equated temperature with the speed of the billiard balls. A hot gas only differs from a cold gas in the speed of the molecules flying around. Faster molecules crash with more momentum and thus impart more pressure. Squashing the gas into a smaller volume does not give them more speed, but means more collisions each second, so higher pressure. This is a pretty serious finding. It basically says ‘there is no such thing as temperature’. There is only lots of little balls flying around, and their number and speed dictate the pressure they exert, and there is no ‘temperature’. If we put a thermometer into the gas, what is it detecting then? Great question. It turns out that solids are also made of lots of balls, except, instead of being free to fly around, they are trapped in a matrix. When a solid is exposed to a hot gas, it is bombarded by fast flying atoms. When a solid atom is hit, instead of flying off, it starts to vibrate, like a ball constrained by a network of springs. So the ‘temperature of a solid is also a measure of speed of motion, but rather than linear speed it’s a measure of the speed of vibration. This makes a lot of sense – as the solid gets hotter, the balls are going literally ‘ballistic’ and eventually have enough speed to break the shackles of the matrix (aka melting). So this model of heat as ‘movement’ not only explains how gases exert pressure, but also explains how heat flows (through molecular collisions) and why things melt or vaporise. More importantly, it shows that temperature is really just a symptom of another, more familiar, sort of energy – movement (or kinetic) energy. Energy is a whole story of its own, but we can see now how energy and temperature relate – and how we can use energy to make things hot and cold. There are many easy ways to make things hot. Electricity is a very convenient tool for heating – it turns out that when electric current flows, the torrent of electrons cannot help but buffet the atoms in the wire, and as they are not free to fly away, they just vibrate ever faster, ‘heating’ up. Another way to heat things is with fire. Fire is just a chemical reaction – many types of molecules (like methane, or alcohol) contain a lot of ‘tension’, that is to say, they are like loaded springs just waiting to go off. Other molecules (often oxygen) hold the ‘key’ to unlocking the spring, and when the springs go off, as you can imagine, it is like a room full of mousetraps and ping-pong balls – and all that motion – means heat. Manipulating energy flows to make things cold is much trickier. One way it to just put the thing you want to cool in a cold environment – like the north pole. But what if you want to make something colder than its surroundings? Well there is a way. We learned earlier that gases get hot when compressed – it turns out they do the opposite when decompressed or ‘vented’. This is the principle that makes the spray from aerosol cans (deodorant, lighter fluid, etc) cold. So how can we use this? First we use a compressor to compress a gas (most any gas will do); in the process it will warm up, then you let it cool down by contacting it with ambient air (through a long thin copper tube, but keeping it compressed), then decompress it again – hey presto, it is cold! Pump this cold gas through another copper tube, inside a box, and it will cool the air in the box – and hey presto, you have a refrigerator. Before we had thermometers, temperature was generally estimated by touch. However this is where temperature gets tricky. Because the temperature we feel, when we put our hand on the roof of a car is not really the temperature of the car, it’s really the measure of energy flow (into our hand), which relates to the temperature, but also relates to the conductivity of the car. This is why hot metal feels hotter than hot wood, why cold metal feels colder than cold wood – the metal, if at a different temperature to your hand, is able to move more heat into you (or take more heat away) faster than wood can. Thus our sense of temperature is easily fooled. The ‘wind-chill factor’ is another way we are fooled – we generally walk around with cloths on, and even without clothes we have some body hair – therefore, we usually carry a thin layer of air around with us that is nearly the same temperature as we are. This helps us when it is cold and when it is hot – however, when the wind blows it rips this layer up and supplies fresh air to our skin – making us feel the temperature more than usual. Also, because our skin can be damp, there can be evaporative effects which can actually cool you below the air temperature. Scientists have long known that we cannot trust ourselves to measure temperature, so over the ages many tricks have been developed – can the object boil water? Can it freeze water? A long list of milestone temperatures was developed and essential knowledge for early scientists – until the development of the lowly thermometer. It was noted that, like gases, solids and liquids also expand upon heating. This makes intuitive sense if you think of hot molecules as violently vibrating – they push one another away, or at least if the charge (electric charge is what holds these things together) is spread just a little thinner, adjacent molecules will have slightly weaker bonds. The expansion of liquids may only be very slight, and if you have a big volume of liquid in a cup, the height in the cup will change only very slightly, but if its in a bottle with a narrow neck, the small extra volume makes a bigger difference to the level. This principle is used in a thermometer – it’s just a bottle with a very narrow and long neck. The bigger the volume and the narrower the neck, the more sensitive the thermometer. Of course the glass also expands, so it is important to calibrate the thermometer – put it in ice water, mark the liquid level – then put it in boiling water and mark the new level. Then divide the distance between these marks into 100 divisions – and hey presto! you have a thermometer calibrated to the centi (hundred) grade (aka Celsius) scale. Now you know where that came from! So that is temperature explained in a nutshell. If you enjoyed this article you may enjoy my related article on energy. There is a growing movement, grassroots in nature, but starting to connect, called the skeptics community. Who exactly are they? Are they people who are starting to uncover the truth – that most world governments are a sham and that secret societies control our every move? Do they deny the holocaust and suspect 9/11 was a complex plot? A skeptic is merely someone who needs to be convinced of things through reason, rather than one who accepts things on some-one’s say-so. So what is a global warming ‘skeptic’? Climate science is complex, and consensus opinion is that man’s activity has led to increased greenhouse gas emissions which are likely to reduce outgoing radiation and thus lead to a net shift upward in the temperature of the Earth’s delicate surface. Yes, there are other possible causes, yes, the models contain assumptions, and yes, some fools have fabricated data to look cool. It is also true that many respected scientists will not say it is a cast iron ‘fact’. A ‘global warming denier’ has come to mean someone who does not think the evidence stacks up enough to warrant concern, or worse, thinks it is all a giant conspiracy. A ‘global warming skeptic’ has come to be somewhat synonymous with a denier, but perhaps without the conspiracy angle. However, many are just people who are on the fence – they are often very smart, and don’t just believe what they are told, but on the other hand, they are easily misled, as there is just so much misinformation out there. They may be the ones who say “I heard the jury is out…” rather than actually looking at evidence. Some legitimate scientists have foolishly allowed themselves to be given this label, just because they debate some small details (like the rate of heating, or the likely nature of socio-political impacts). These scientists are then lumped with deniers. Tough luck to them. I found this is some random folder on the 'net. If it's yours, please let me know, I love it! Update: it looks like it may well be from thisisindexed.com - click it to link - nice one Jessica Hagy! does it conflict with other strong theories? If so, is it strong enough warrant a change to your previous understanding? do the proponents have a proven track record (credibility)? is there any incentive by stakeholders to twist the facts? This describes most good scientists, so its not a bad thing. In the case of global warming, most true skeptics who have looked closely at the evidence and weighed it appropriately, agree that there is real cause for concern. The Provincial Scientist by Jarrod Hart is licensed with Creative Commons.